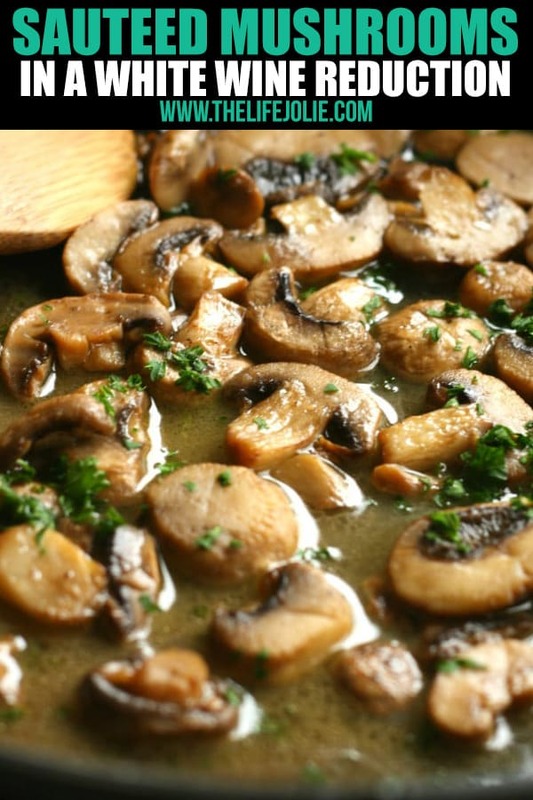 Sautéed Mushrooms in a wine reduction are an easy recipe that comes together really quickly. They’re a great way to use leftover wine! I’ve always really enjoyed mushrooms. Growing up, I always enjoyed them sautéed with garlic and crushed red pepper the way my Grandma Rose prepared them (I will share them soon!). But I also love the way my mother inlaw prepares them. I’ve tried a variety of mushroom recipes and hers are easily top 3! They have the most delicious, savory flavor that one can only come across by throwing a bit of wine into the pan. And really, doesn’t wine always make everything better? Lucky for me, she was more than willing to show me how she made them. It’s a super simple recipe, and like all great family recipes, there are no measurements. But to make your life a bit easier, I went ahead and reached out to J’s mom and she was gracious enough to give me an idea of what the measurements would look like. This recipe calls for a mix of butter and oil because the oil helps keep the butter from burning. I left the salt and pepper to taste- always taste your food and adjust the seasonings accordingly before serving. If you’re not into cooking with alcohol, you can always substitute chicken or beef broth, it just won’t have the same robust flavor. Do I have to use white wine? Nope, this also tastes awesome with red wine. Perhaps avoid using rose or a super sweet wine. What’s the best way to reheat this recipe? You can microwave it or heat it over medium heat in a non-stick pan. Do these sautéed mushrooms really taste good with so few ingredients? Totally! That said, if you want to add additional herbs or spices, have at it. Vicky told me that she sometimes adds chopped shallots for a few minutes before adding the mushrooms to the pan, and also chopped parsley once it’s finished. What is the best way to clean mushrooms? 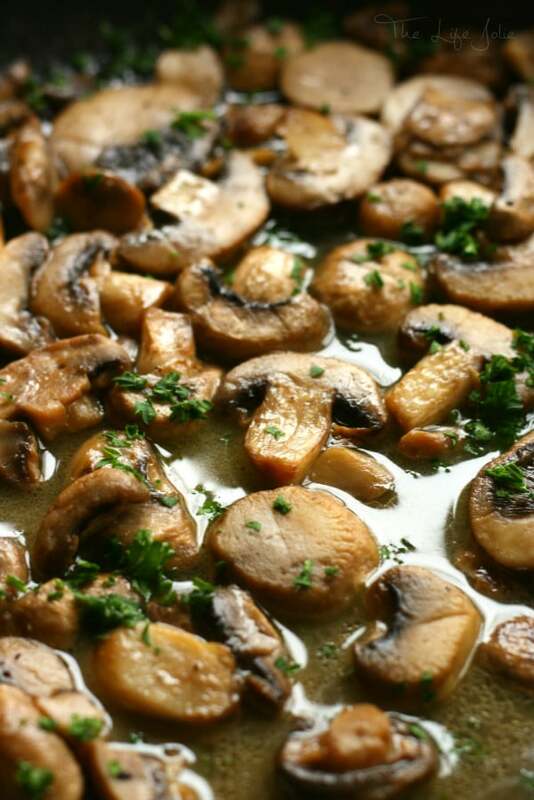 Try to avoid submerging them in water, as mushrooms have really high moisture content to begin with. They sell mushroom brushes for cleaning them, but I’ve found that a damp paper towel does the trick. Or purchase them pre-cleaned. 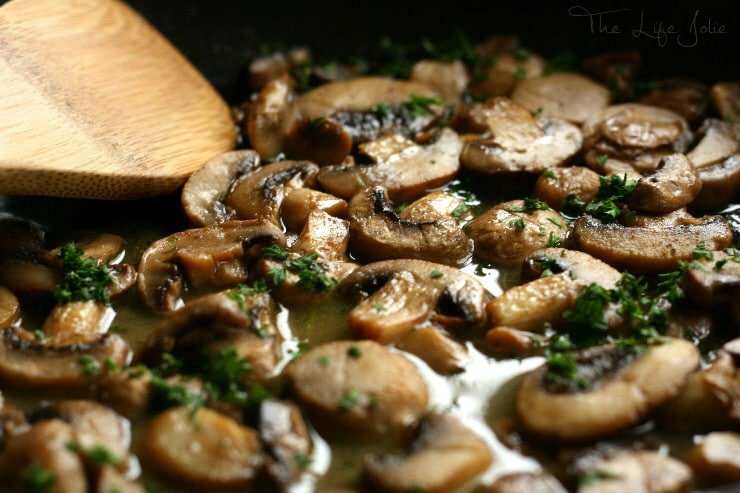 When do you season sautéed mushrooms? Because mushrooms contain so much water already, I don’t add the salt and pepper until later in the process. This allows them to get a nice sear before deglazing with the winer. Then I add the seasoning. How long do sautéed mushrooms last? These last around 3 days covered in the refrigerator. What type of mushrooms do you use? 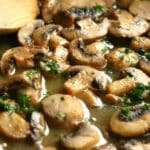 Prefer to use cremini mushrooms, also known as baby bella mushrooms. Button mushrooms also work well. In a large saute pan, melt butter and oil over medium heat. 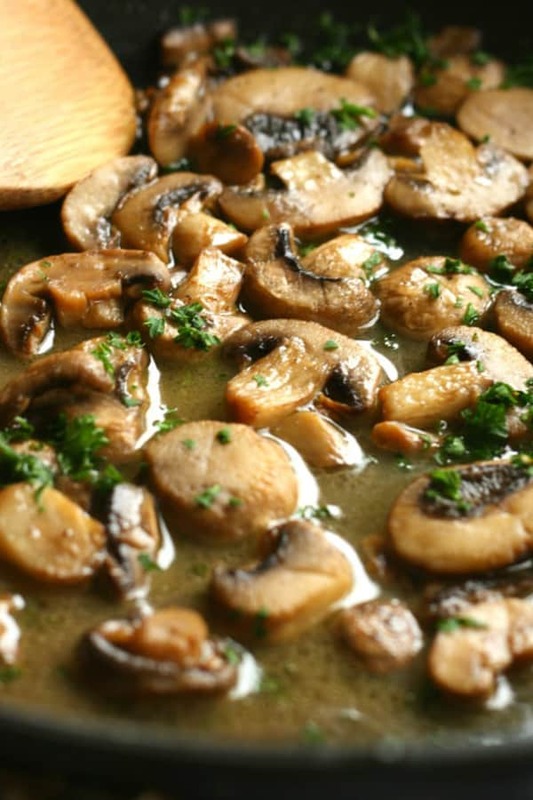 Add your mushrooms and let them brown about a 2-3 minutes per side. When mushrooms are nicely browned, add wine, salt and pepper and deglaze the pan. Let the wine simmer and reduce for 7-10 minutes or until most of the wine has evaporated. Serve immediately. January 6, 2016 at 11:59 am Thank you- I hope you and he enjoy them! January 11, 2016 at 4:01 pm Thank you! January 11, 2016 at 3:57 pm Thank you! 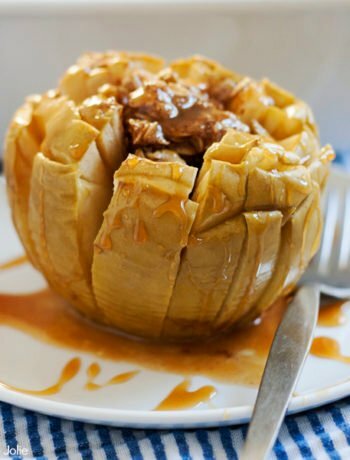 January 14, 2016 at 5:05 pm Looks easy and delicious! My kind of combination! Thanks for sharing! January 15, 2016 at 11:03 am Thank you!